Fillings are one of the most common and effective restorative dentistry treatments in dentistry. Drs. Donald Ross DDS, David Kim DDS, and Neal Shah, DDS, provide two types of fillings at their Atlanta, GA practice. These restorations can repair cavities and minor tooth damage to restore your dental function. They can also seal off your tooth to keep bacteria from getting back inside. Your dentist will conduct a full exam to determine if a filling is a suitable treatment for you. At the same time, he will consider your health needs and cosmetic goals to help you choose the right filling material. The restoration will strengthen your tooth and restore its full functionality. A few days after treatment, you should be able to eat a full, unrestricted diet. Are You a Candidate for a Filling? A filling can be a good option if you have a small to moderately sized cavity. If you have extensive damage, Dr. Ross, Dr. Kim or Dr. Shah may recommend a larger restoration. For example, if you have a big cavity on one of your molars, you may benefit from an inlay or onlay. If you have particularly severe damage, a dental crown may be the solution. This larger restoration will fit all the way over your tooth to restore both appearance and function. We offer fillings made from different kinds of materials. 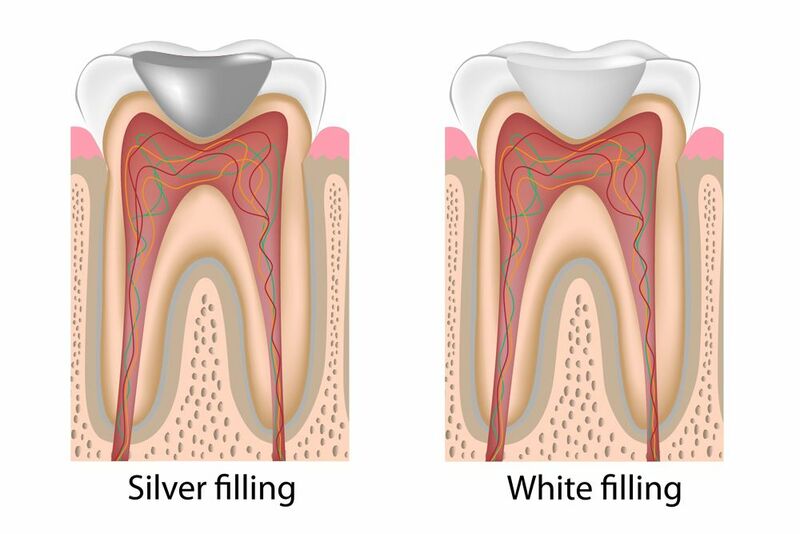 For many years, metal fillings, made from gold or silver amalgam, were the most common option. Metal is hard and durable, and silver amalgam is very affordable. However, over time, these dark substances can start to show through, giving your tooth a gray tint. Therefore, tooth-colored composite resin fillings are becoming a more popular choice. A tooth-colored filling will be a near-perfect match to your teeth, and, with advances in dentistry, the material is almost as strong as metal. Plus, composite has advantages for your overall dental health. The material will form a stronger bond with your tooth, and, unlike a metal filling, it will not expand and contract with temperature variations. When you receive a filling, Dr. Ross, Dr. Kim or Dr. Shah will first administer local anesthesia. Then he will clean out your tooth, removing bacteria and damaged material. Next, he will place a sealant on the inside of your tooth. To create a secure bonding surface for your filling, he will lightly etch the inside of your tooth. Then he will place the filling. If you choose a composite restoration, he will place the material in layers, and he will use a curing light to harden each level. When the entire filling is in place, your dentist will trim off any excess material to make sure that it does not interfere with your natural bite. He will make any necessary adjustments and then smooth and polish your new filling. Dental fillings can have tremendous benefits for your oral health. First, the restoration will strengthen your tooth and restore its full functionality. A few days after treatment, you should be able to eat a full, unrestricted diet. A filling can also eliminate the discomfort of a cavity. Finally, the restoration will seal your tooth to prevent a return of oral bacteria. If you are suffering from a toothache, or if you have been diagnosed with a cavity, contact our office to find out if a filling is right for you.